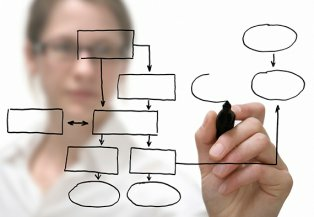 WHAT IS AN AGILE METHODOLOGY ? ‘Agile’ refers to a set of ideas and methods for software development project management, characterised by a collaborative, flexible approach. Typically, it means that at each stage – or ‘SPRINT’ – of development, what’s produced is a working product, albeit a stripped-down version of the final system that doesn’t yet have all the features planned for the finished project. Agile methods allow for software requirements to grow or change across the course of their development. We recognise that every client, and every project, is unique, and not every piece of software will follow the same development path. Your business process needs might change over the course of the project, as new challenges arise, or new opportunities for improvement present themselves. With Agile, we’re able to adapt to these changes – and make sure you’re kept informed every step of the way. It’s not just our clients we keep on the same page – our use of ‘Scrum’ methods (a internal framework for Agile software projects) encourages a collaborative approach among our different development teams. Our developers work as a cohesive unit to deliver your project, continually updating each developer on progress made, and what’s left to do. Scrum encourages fast feedback and the ability to adapt rapidly to change; the benefit of this for our clients is simply that their bespoke software is delivered sooner, with fewer potential disruptions along the way.